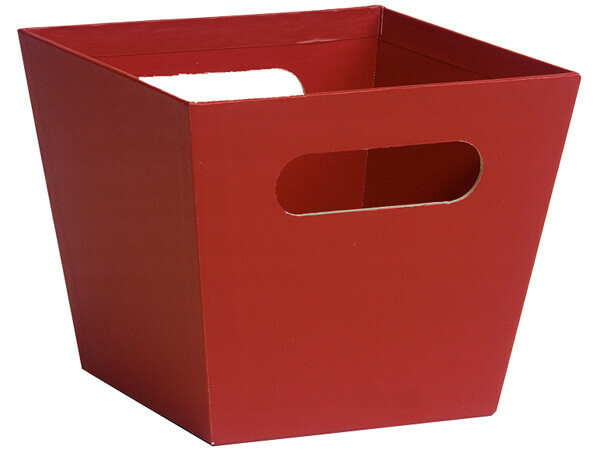 Large Red Square Gourmet Market Tray 6-1/2x6-1/2x5-1/2"
Beveled Gift Basket Containers in popular solid matte colors. These versatile containers are made from heavy laminated boxboard and are great gourmet gift baskets, food baskets or even as a home decor decorative accessory. Open top beveled containers have cut-out handles and are printed in the interior as well as all sides. We recommend a food safe barrier such as a clear cello sheet or a cello bag as a bottom liner.